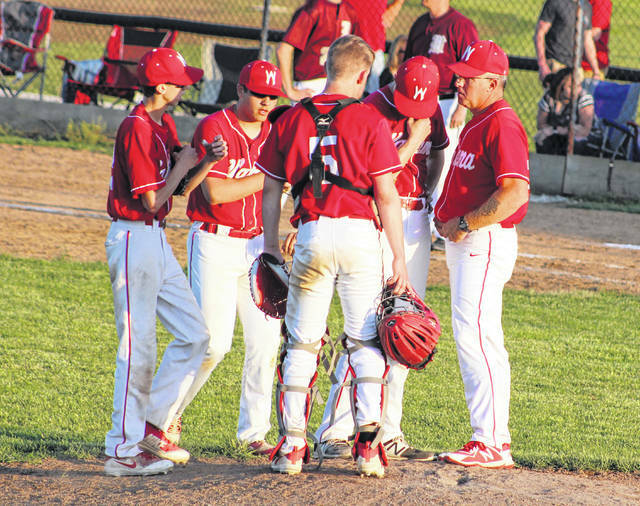 Wahama baseball coach Billy Zuspan, right, talks with his infield during a seventh inning visit to the mound Thursday night in a Class A Region IV, Section 1 baseball contest in Williamstown, W.Va.
WILLIAMSTOWN, W.Va. — One strike away from it not slipping away. Top-seeded Williamstown scored three runs with two outs in the bottom of the seventh to force extra innings, then tacked on the winning run in the 10th while claiming a 12-11 victory over the visiting Wahama baseball team on Thursday night in a Class A Region IV, Section 1 loser’s bracket semifinal at the Post 159 American Legion Field in Wood County. The third-seeded White Falcons (17-12) led 3-0, 6-4 and 9-6 after two-and-a-half innings of play, but the host Yellow Jackets (24-5) rallied with two scores in the bottom of the fifth to close back to within a run at 9-8. The Red and White, however, tacked on two big runs in the top of the sixth to extend their cushion back out to three runs — which ultimately held up headed into the last half of the seventh. 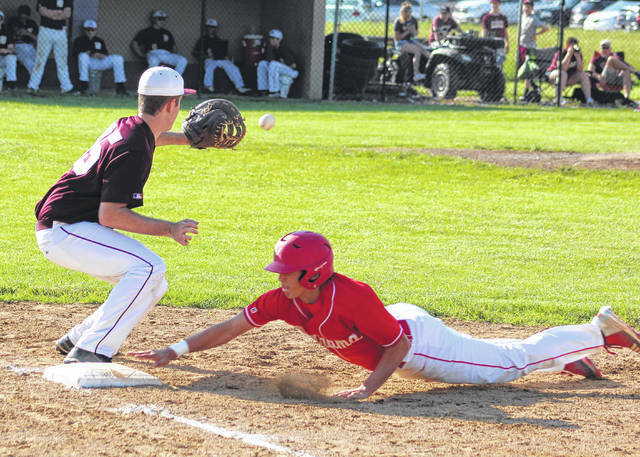 Williamstown — the third-ranked team in all of Class A — started the seventh with consecutive outs from its eight- and nine-hole spots, bringing the top of the order around with only one out left to work with. The Maroon and Gold responded with a five-pitch walk to Mason Adkins, who advanced to second and later scored on a single from Leewood Molessa for an 11-9 contest. Bradan Mullenix was hit on the foot by a 2-2 offering in the next at-bat, then cleanup hitter Cullen Cutright drew a full-count walk to load the bases. Baylor Haught — a pinch-runner for Molessa — and Mullenix both came around to score as Trenton Lynch delivered a single to center, tying the game at 11-all. Williamstown did leave the bases loaded in the bottom half of the seventh, but enough damage was done to extend the game. The White Falcons produced two baserunners over the next two frames, while the hosts managed only one baserunner in the eighth and ninth innings. The guests also went down in order in the top of the 10th. Austyn Smith started the home half of the 10th with a leadoff single, advanced to second on a passed ball and moved over to third on a 6-3 putout off the bat of Ethan Tawney. The Jackets then received back-to-back intentional walks to load the bases with one away, and the top of the order was headed to the plate. With a drawn-in infield and a force at any base, Adkins drilled a 1-2 offering straight at second base. The hot smash bounced off of the glove of a leaping defender, allowing Smith to come home uncontested for the 12-11 decision. It was a bitter pill for WHS first-year coach Billy Zuspan to swallow afterwards, knowing that a trio of three-runs leads slipped away. But, as he noted, sometimes that’s just the way the ball bounces in this game. The White Falcons established a 3-0 lead in the top of the first as Tanner Smith singled home Colton Arrington, then David Hendrick tripled in Smith for a 2-0 cushion. Antonio Serevicz followed with a one-out single that brought Hendrick home. Four hits, an error and a passed ball allowed Williamstown to take its only lead of the night in regulation, plating four runs in the bottom of the first for a 4-3 edge. With the bases loaded and nobody out in the top of the second, Smith and Hendrick delivered back-to-back RBI ground outs that plated Bryton Grate and Dalton Kearns for a 5-4 lead. Serevicz followed with two-out single that allowed Arrington to come home for a 6-4 advantage. The Yellow Jackets tied the game in the home half of the second as Nate Suprano scored on an error and Haught scored on a bases-loaded walk to Evan Amos with two away, knotting things up at six after two complete. With the bases loaded and two away in the top of the third, Smith cleared the bases with a double to left-center. Anthony Ortiz, Grate and Arrington all scored on the play as Wahama reclaimed a 9-6 cushion. Williamstown closed the gap in the fifth as Adkins belted a two-out triple to right-center, allowing Tawney and Suprano to come plateward for a 9-8 deficit through five full frames. The White Falcons used a trio of Jacket errors and a hit in the sixth to rebuild the lead back out to three, with all of those miscues coming with two outs. Grate and Kearns both reached safely and were on the corners after a pair of shortstop errors, then Arrington singled home Grate for a 10-8 edge. Kearns later scored on an infield error that allowed Smith to reach safely, making it an 11-8 contest midway through seven frames. The White Falcons outhit the hosts by a 14-13 margin and committed four of the nine errors in the contest. The guests stranded a dozen runners on base, while Williamstown left 15 on the bags. Mullinex was the winning pitcher of record after allowing two unearned runs, three hits and one walk over six innings of relief work while striking out 13. Frye took the tough-luck loss after surrendering one earned run, two hits and two walks over 2⅔ frames of relief while fanning two. 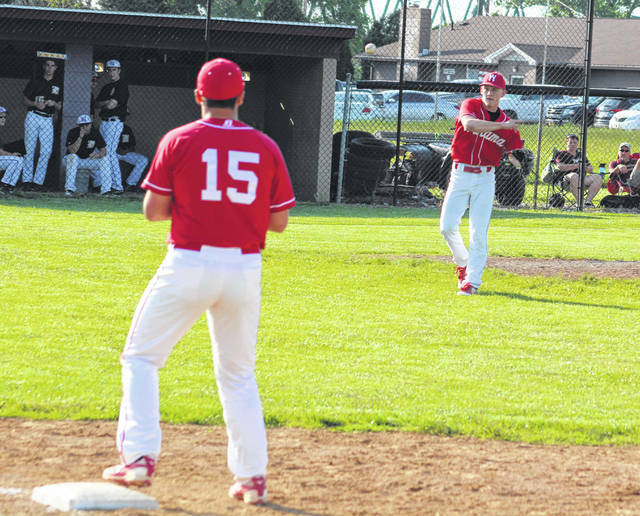 Smith led Wahama with three hits and five RBIs, while Arrington also had three hits. Kearns, Hendrick and Serevicz were next with two safeties apiece, while Ortiz and Cooper Peters also had a hit each. Adkins and Trenton Lynch led the hosts with three hits and three RBIs apiece, with Tawney also providing two safeties. Molessa, Mullinex, Cutright, Amos and Smith also had a hit each in the triumph. It was the final baseball game for seniors Bryton Grate, Colton Arrington, Dalton Kearns and Anthony Ortiz in the Red and White. This quartet has been part of a pair of state championships during their careers, as well as TVC Hocking crown and numerous postseason victories. Seeing them go out this was difficult, but Zuspan spoke highly of his upperclassmen. He also feels, moving forward, that Wahama’s future still looks strong. 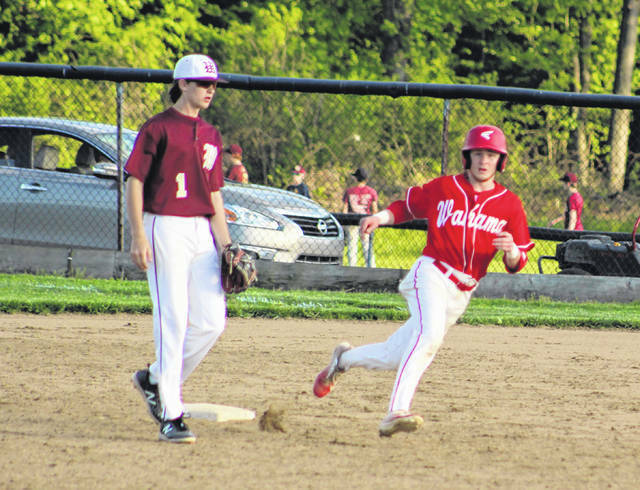 Wahama finished the 2018 campaign with a 9-7 mark in TVC Hocking play.